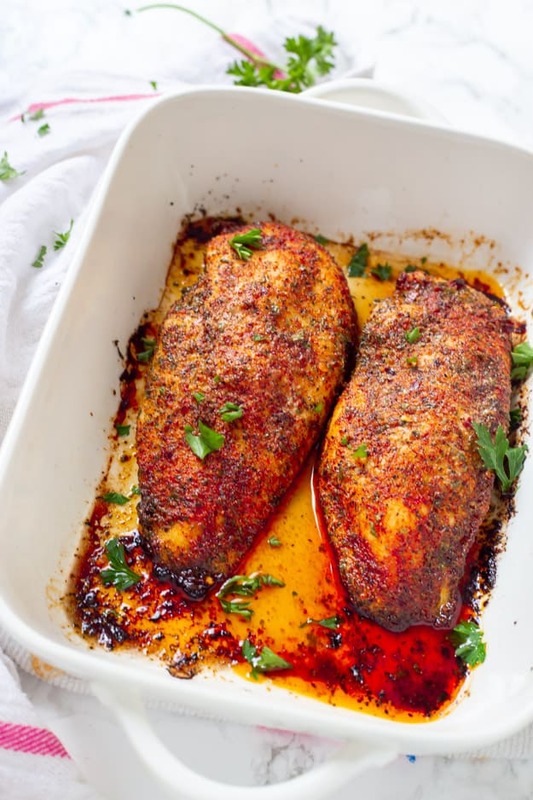 Perfect Oven Baked Chicken Breast are incredibly juicy and flavored with the perfect amount of seasonings. Foolproof tip shared on how to bake the juiciest chicken breasts ever. I never used to enjoy baked chicken breast until I found the perfect way to bake them. Every time I used to have them, they always came out so dry! They weren’t good at all so; instead, I used to slice them in half (still do if they are large) and pan-fry them or grill them. Not anymore friend! Okay, well occasionally I will pan-fry or grill them if it’s too warm to turn on the oven. 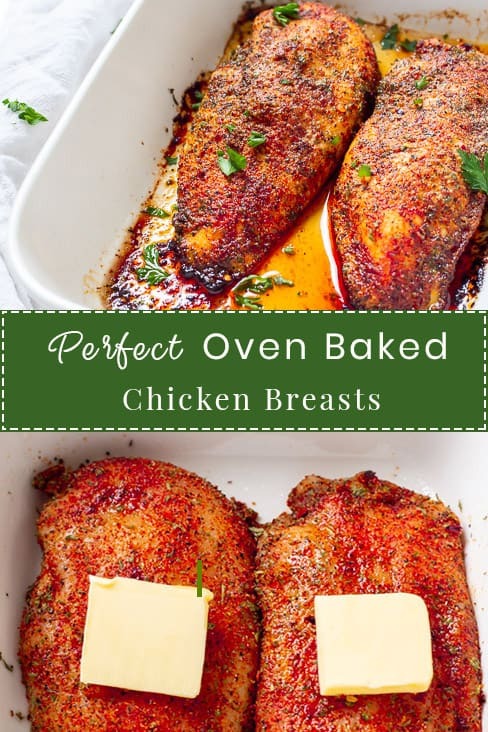 This perfect oven baked chicken breast recipe is to die for! They are juicy on the inside with the perfect amount of seasoning and flavor. I also like to call them an all-purpose chicken breast because they go with just about everything. It’s a staple in my kitchen, and I hope they will be in yours as well. 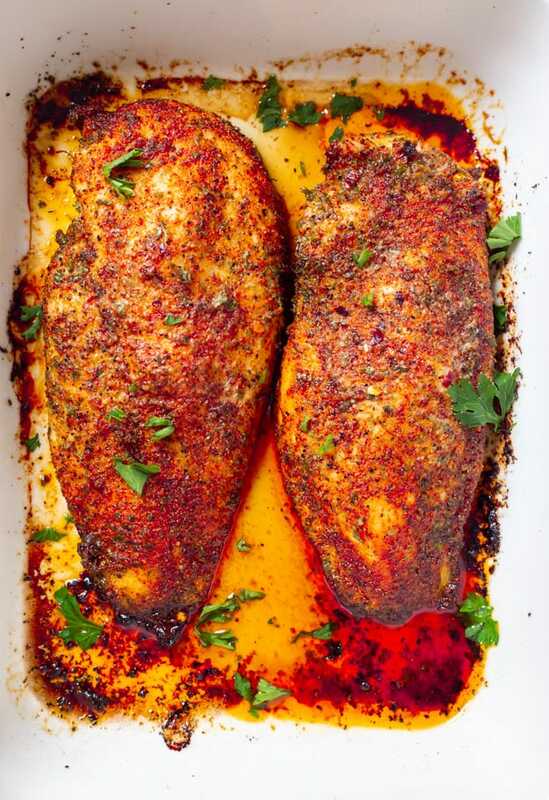 What makes this baked chicken breast perfect? Okay, I know you are dying to see how these chicken breasts are perfect! 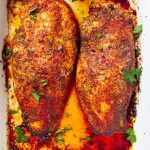 A couple of years ago I perfected my oven baked chicken breast recipe with my cajun chicken breasts (scroll down for the link, they are delicious!). It’s nothing complicated at all. 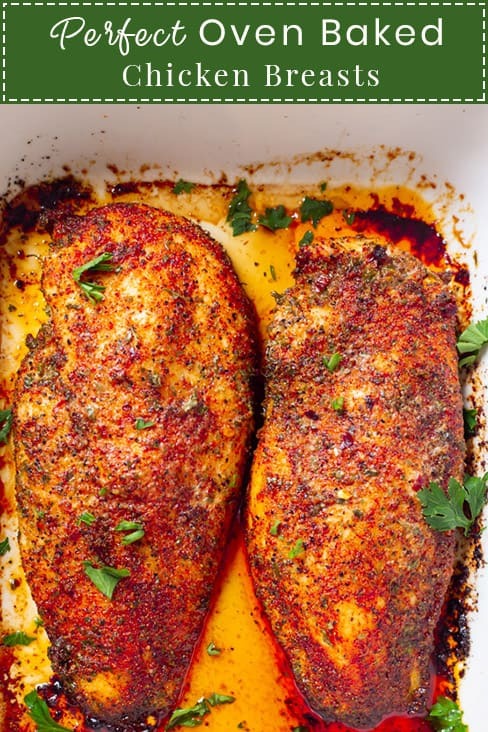 The concept to making juicy, perfect chicken breasts in your oven every single time is with a high temperature, little baking temperature, covering the chicken breasts in foil, and then allowing them to rest for 5-10 minutes. That’s it. I told you it was easy. The first time I made baked chicken breast for my mom, she was shocked and couldn’t believe they didn’t need to be baked longer. High temp + not a lot of baking time = perfect weeknight meal. Right?! I love having a small side salad with sliced cucumbers, diced tomatoes, and a little dressing with any meal. These Italian roasted vegetables are perfect when root veggies are in season. Instant pot mashed potatoes would be ultimate comfort food for me on the side. These lemon butter green beans are out-of-this-world delicious and would pair beautifully with an all-purpose seasoned chicken breast. I could go on-and-on what to serve so take a peek at all of my side dishes to see if anything peaks your interest. Casserole dish – This isn’t the exact one I have, I found mine at Pottery Barn, but this one is on my wants. It’s a great staple casserole dish. Pink Himalayan Salt – This is my all-time favorite salt and I use it for everything. You will want to make sure it’s ground in a salt ginger before adding into the spice blend. Mix together garlic powder, onion, paprika, chili powder, pepper, salt, crushed red pepper flakes, and parsley together in a small ramekin. Slice the large chicken breasts in half lengthwise to create 4 chicken breasts. Brush olive oil on both sides of chicken breasts. Rub the seasoning blend onto each side of the chicken breasts making sure all sides are coated well. 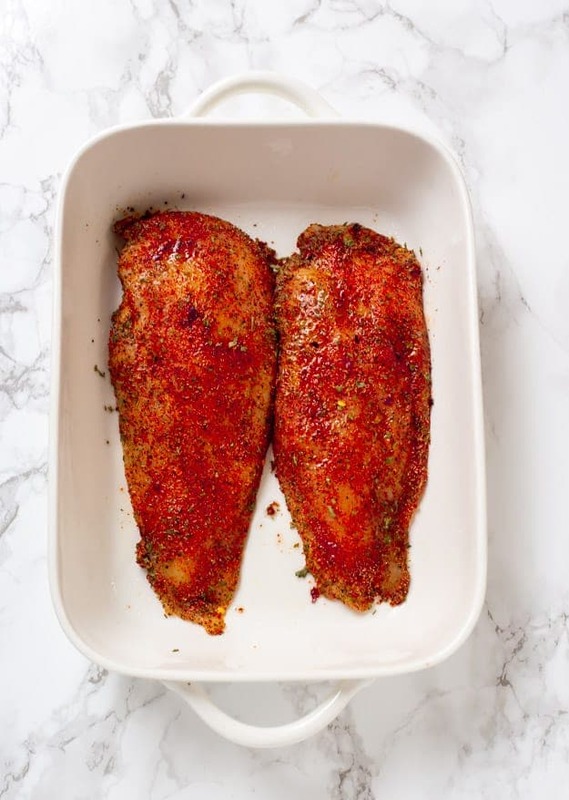 Place seasoned chicken breasts in a baking dish. 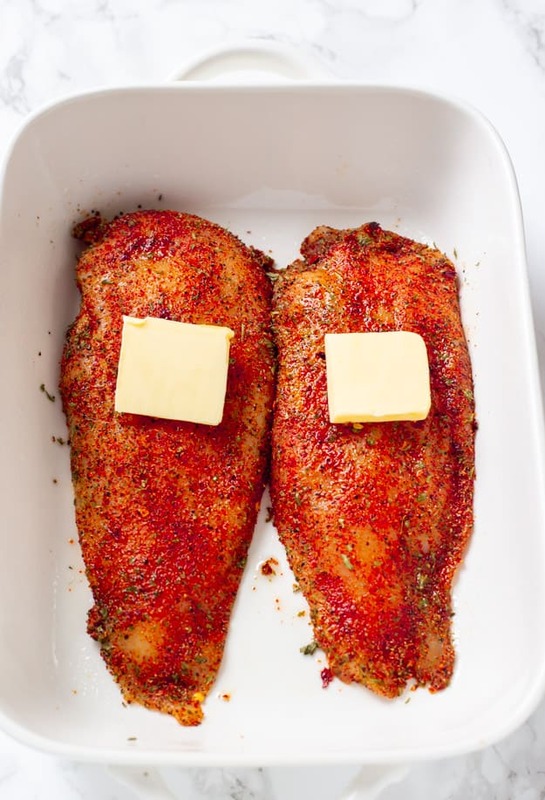 Place half of a tablespoon of butter on top of each chicken breast. Bake for 18 minutes. Remove baking dish from oven and place aluminum foil on top and bake for another 4-5 minutes. Remove chicken breasts from oven and allow them to rest for 5 minutes and serve. You make use smoked paprika for more flavor. Hello. . . these chicken breasts look so easy and delicious. My question is you said to cut the two breasts in half. The chicken was absolutely delicious. The flavor was GREAT. I will be making this again.